My family is always raving about this Potato Salad, I'd dare even call it The Best Potato Salad Ever! It's a lot like the potato salad you had as a kid but even better and with less calories thanks to the light mayo. It's rich and creamy, it's perfectly flavorful, it's hearty, and it has all the best textures. Every summer I turn to this recipe for cookouts, weeknight dinners or picnics. 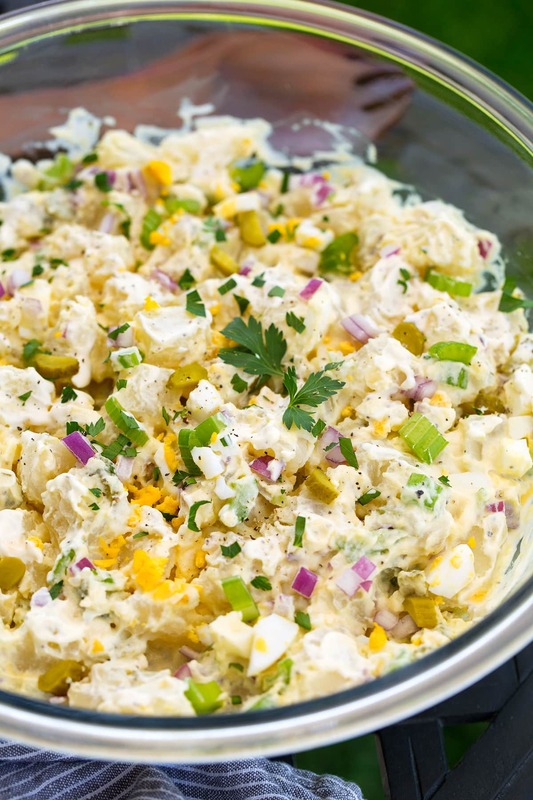 It's got everything I want in a potato salad and it's always a crowd favorite! Want to see how easy this potato salad recipe is" Watch the video! It does require a few steps (mostly those annoying chill times) but the end result is so worth it, trust me. Try it once and it may just become your potato salad recipe for life!